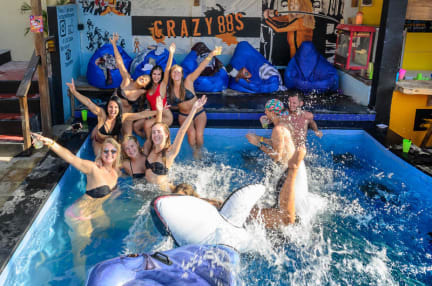 Are you looking for a place where you party by the pool, challenge our 6 meter climbing wall then free fall 6 meters in to the pool, enjoy Bintangs and awesome music at our bar during the day and night?? Then Gili Castle is the place for you! Our amazing staff know the island well and are open for every question you may have. We are very close to the best snorkeling beach, restaurants and parties! We offer a variety of rooms starting with our mixed 3 bed dorm with a personal locker and reading light with or without hot water and en-suite. For a bit of extra comfort you can reserve our private double room with king size bed and en-suite bathroom that overlook our pool. All of our rooms are air-conditioned as well. We have free WiFi, tea, coffee and a fresh water re-fill station to re-fill your bottle. Every Thursday we host the Thirsty Thursday Pool Party! You do not want to miss out on the popular Beats & BBQ Sunday Session Pool Party every week! We have a live DJ, free shots, drinking games and more. Don’t miss out on the fun! Our sister hostel, Gili Mansion, is only a 2 minute walk down the road from us. You automatically have full access to their facilities parties and social area . If you’re interested in scuba diving we partner with Gili Divers and you will get a discount from your room rate when you stay with us and dive them . 1. Check IN time is from 12pm. Please give us notice if you arrive later than 2pm to secure your booking. 2. Check OUT time is 10:30am. (a) If you would like to extend your stay, please let reception know 24 hours before, with a deposit to secure your room. (b) Any late check outs will be charged Rp. 100,000 extra. 3. FULL PAYMENT of balance must be paid on arrival in CASH. Credit Cards will NOT be accepted. 5. Minimum age to stay at the hostel is 18 years old. 6. Dorm beds are allocated on a first come first served basis by the Hostel World booking system. If you are a group booking and would like to be in the same room together, please email us to allocate your beds together. 7. Bringing your own alcohol inside the hostel is prohibited. We provide safe alcohol at the bar. All outside alcohol will be confiscated. 8. STRICTLY NO DRUGS. Taking or dealing drugs is a big NO! Anyone caught, will be evicted immediately and will be reported to the police. 9. Any damages caused by drugs or alcohol will be charged accordingly. 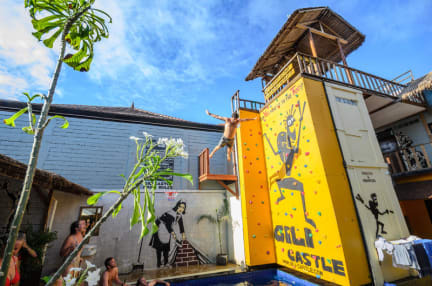 Party hostel, sister hostel to Gili Mansion. Location was great as well as the facilties..the bathrooms need a good scrub but other than that would deffinetely recommend! Dirty rooms and bathrooms. If you are up for a party and don’t care what conditions you sleep in then this place is for you. Personally wanted slightly more privacy, but other travellers seemed to enjoy the vibe. Similar to kuta.